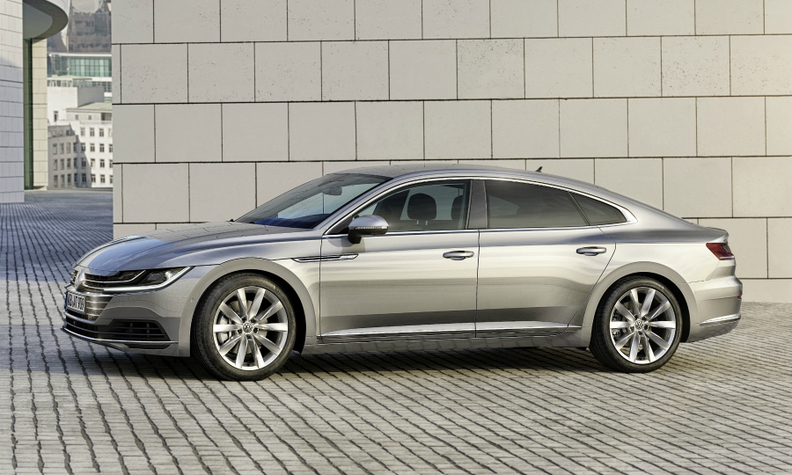 The Arteon, pictured, is one of 10 new vehicles the VW brand plans to launch this year. GENEVA -- Volkswagen Group's core VW brand reduced its fixed costs in Germany for the first time in nearly a decade last year, but management doesn't expect the brand can maintain the same momentum as it launches its biggest product offensive to date. VW brand plans to launch more than 10 new vehicles this year, five of which were not previously in its range. These include the Arteon fastback, the T-Roc compact crossover, the Atlas SUV in the U.S., the Phideon flagship in China and the Virtus sedan in Brazil, along with the latest generation of its Polo subcompact car. In November, VW announced that as part of its long-term strategy plan, the brand wants to permanently reduce its cost base by 3 billion euros in Germany by 2020 in order to double its operating margin to 4 percent over the 2015 level. This would be achieved in part through the elimination of a net 14,000 domestic jobs with the help of early retirement and natural fluctuation. VW brand chief Herbert Diess said last week at the auto show here that fixed costs were reduced last year by 300 million in Germany, where the brand employs about 120,000 workers, the first time that has happened since 2007. VW brand finance chief Arno Antlitz said the effects of the efficiency program are "slowly starting to spread." When asked whether the brand could match or exceed the improvement in fixed costs this year, Antlitz was cautious, saying it would be difficult to achieve similar feat. "These 300 million were a one-time reduction year over year," Antlitz told Automotive News Europe in Geneva. "It's natural that when you launch a product offensive as well as all these new technologies such as developing the MEB [electric vehicle architecture], it's probably not possible to lower fixed costs further year over year," Antlitz said. The last time VW's German operations underwent a wide scale restructuring was back in late 2006, when then-VW brand chief, Wolfgang Bernhard, struck a deal with local unions to cut thousands of jobs. Weeks later he departed the company after the Group CEO who hired him, Bernd Pischetsrieder, was replaced by Audi boss Martin Winterkorn. VW Group will publish detailed 2016 results for its brands on Tuesday.